Look for his answers and comments about the tournament on theage.com.au and in The Age. Here's a few of the questions that readers have sent in so far this week, with Rafa's responses below. Question from Mark: Hey Rafa. You obviously play a very physical game of tennis. Do you ever have any concerns that your style of play or your demanding training regime is shortening the longevity of your career as a player? Cheers. Rafa says: Thanks Heather. The foot is well and since I changed the insoles and a more careful treatment it's holding up pretty well. No real concerns for the moment. Question from Lauren: Rafa, I have been a fan of your game for a long time. I respect Rogers' natural ballerina-like ability to glide across the court. However, I became your fan because I came to respect the way you have had to continuously change your style of play since day one. That being said, do you believe the saying: "Hard work can beat talent when talent doesn't work hard." ? And what would your advice be to kids without "natural-born talent" who have a dream to become a great champion like yourself? Rafa says: You need a combination of both hard work and talent. I can only speak for my self, obviously, so I can tell you that the hard work is there and that at some stage I am gifted by nature to do sport. That allows me to be up there fighting to win tournaments. Clearly Roger has an enourmous talent, something amazing and beautiful to watch. My advice to kids is to enjoy, firstly to enjoy. Then to have fun and to work hard when things get serious! Question from TJ: Rafa, why don't you weight train both your arms instead of only your left arm? OK, I get you're a left hander but it looks silly being so out of proportion. Rafa says: I don't weight train neither! I do compensation work on my right arm though! Question from Maria: At what age did tennis really become your main focus for you and which was your first greatest achievement in tennis? Also, do you have any tips for someone who started a bit late to train for tennis but still wants to become pro? Rafa says: I think I can say around 11 years of age. I had to decide then to choose between soccer and tennis. No complaints for the moment! Question from Wendy: Would you ever play in Sydney before the Aust Open? Rafa says: The calendar is very heavy and it is difficult for me to play the week before a Grand Slam. But as they say, never say never. Question from Mary: Hi Rafa. Welcome to Melbourne. The weather is quite warm & unless you're in airconditioning what do you do to keep yourself cool apart from the aquarium? I also remember you saying that you didn't have any luck at the Casino last year or the year before. Will you have another flutter & if so, what do you prefer to play, cards, pokie machines, any preference? PS I love your outfit for the A.O. & I'd love a pair of shoes from Tuts and Roy. Rafa says: When we are at the tournament site we have the Players Area and locker room and at the Hotel where I am staying, by the way it is probably one of the best if not the best of all year around, I have a great room. So no worries as they say here. Regarding the Casino I have been there a couple of times and I did pretty good considering I don't play much. I like to play here at the Crown some blackjack but as I say small amounts and just for fun. Question from svittal: During the Davis Cup final and semi finals you played exceptionally well. You seemed really motivated. Did than the fact you were playing for your country and the pressure of not having Tony Nadal but Albert Costa as a coach have any effect on your game? Does the fact you seem to suffer from injuries prevent you from bringing in a new dimension to your game and this makes it more impossible to beat players like Djokovic? 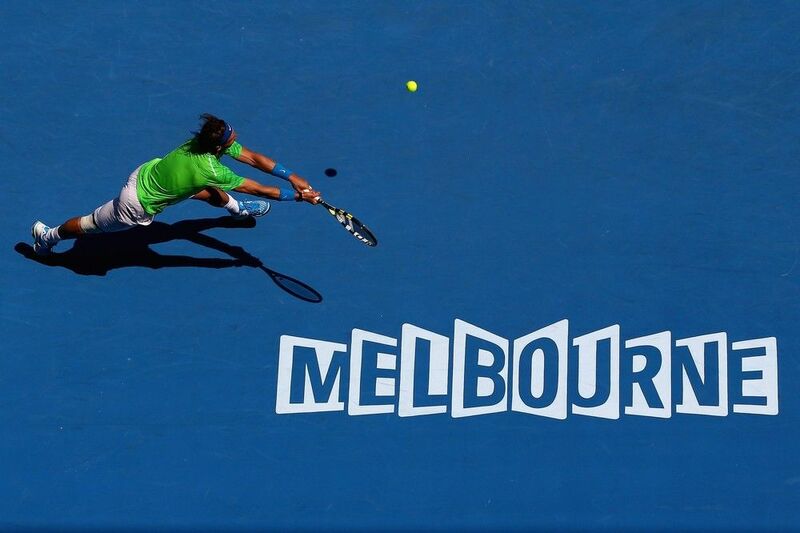 Wishing you all the the luck at the Australian Open. Rafa says: I love to play for Spain but believe me no pressure from Toni. By the way Toni was there in Seville also so... And regarding the second question, no I don't think so. Rafa says: Keep looking always at the ball and toss it a bit higher. Question from Andy, NSW: Dear Rafa, I am the BIGGEST FAN of you! I wanted to know if this year you are feeling fit enough and at your best this year to win all the grand slams!? Ps I know you can do it! VAMOS RAFA! Rafa says: So far so good. Many thanks! Question from cwing: What is your solution to the problems associated with jet lag? Rafa says: I think it is important to stay awake if you get in the morning to the city. You have to get your body used to the new time. Question from Deylan Kilic-Aidani: After Tomic has shown that he can rise to the occasion, after coming back from to sets sown to defeat Verdasco, and after his win at the Kooyong classic, do you think that he is capable of winning a grand slam at this stage of his career? Rafa says: It is difficult to say but you never know. There are players out there that can make it very difficult for young players. Experience is something important. But I am sure he will be a great player and soon a contender to win big tournaments. Question from Lizzie: Hi Nadal! I am a huge huge fan of yours! Sometimes its funny watching your interviews because sometimes you struggle with your English (although you have improved so much !) What accent is the hardest for you to understand? Good luck Rafa! Question from Ian Wood: Where did Rafael get the white T shirt He had on at his interview? Rafa says: Nike sells it at the Nike Shop here in Melbourne. Rafa says: Well yes, you always have to improve and try to be a better player. If you stay and do nothing clearly you will lose. Novak has improved a lot and his year last year was amazing. Roger is still Roger and he is always someone who can win everything. Murray also played unbelievable last year and that is the prove you have to keep improving. Sure I try to adapt and change things to be a better player. Question from Ashley McGlynn: More on your image than tennis, many non-Spanish speakers may not know the real Rafeal Nadal, what makes you get up every morning? What drives you to do what you do? And, what are your plans, if you have any yet, for life after tennis? Rafa says: Well I like the competition and everyday I love the challenge to be there and competing to have the chance to win. This drives my motivation and I like this. I am still focusing almost 100% on my game, on my tennis life and to be honest with you I don't really think about my life after tennis. Question from David Dennis: Do you think Bernard Tomic can beat Roger Federer if and when they meet? What do you like most about Tomic's game and what can he improve on? Rafa says: Bernard is still young and he has a great potential. If he continues this line he will for sure be up there in the rankings and a serious contender to win titles. I am not sure if he can beat right now Roger. Roger is Roger and he is still the big favorites to win every match he plays. Question from Mary Tomalaris: I see the bookmakers have you fourth favourite for the tournament. How does it feel not to be favourite as usual? Does it take the pressure off at all? Rafa says: It feels great. I don't ever had pressure from the bookmakers but in any case I have no problem with that, even better, also for my fans. Question from Jon Davis: Is there really a feud going on between you and Roger or just a difference of opinion playing out in the media? Rafa says: I think we are all grown up and we can agree and disagree. I made a mistake I now regret in telling the media all my thoughts, as I always do. Sometimes you can't say everything and it is better to discuss things among ourselves. My relationship with Roger is and will always be very good, I have a lot of respect and admiration for him even if we don't agree on everything which on the other hand can happen and is a normal thing in life. I am sure you agree. Question from Judy Green: What are your favourite places to go out in Melbourne? Rafa says: The aquarium, I love it and I always go there. I also enjoy St. Kilda. I also like the great restaurants here! Question from Ramon Martinez: How many people do you bring with you in your entourage when you come to Australia? Rafa says: I normally travel with my coach Toni and if he doesn't come with Francis Roig. Also with my Physio Rafel Maymo and my PR guy Benito Perez-Barbadillo. These are at every tournament around the world. Also Carlos Costa, my manager, that comes to all the big events. Here in Melbourne this year my father and my uncle Miguel Angel are here too. Marc Lopez with whom I play sometimes doubles is here competing in doubles but I could say he is part of the team too! And Tuts and Roy from NIKE who are also here!!!! Big group here that I enjoy being with.